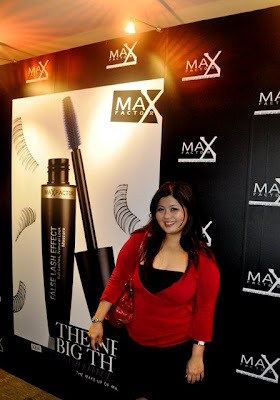 I first saw Max Factor products are in Hong Kong Langham Mall, where they have this small counter... however I didn't manage to grab their famous False Lash mascara as was rushing for my sight seeing. 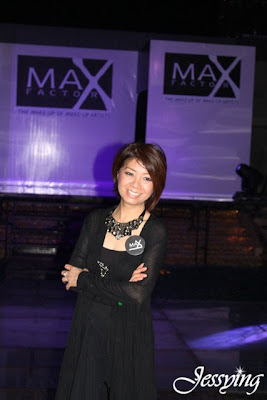 So when I was invited to attend the launching of Max Factor launching, I was thrilled! 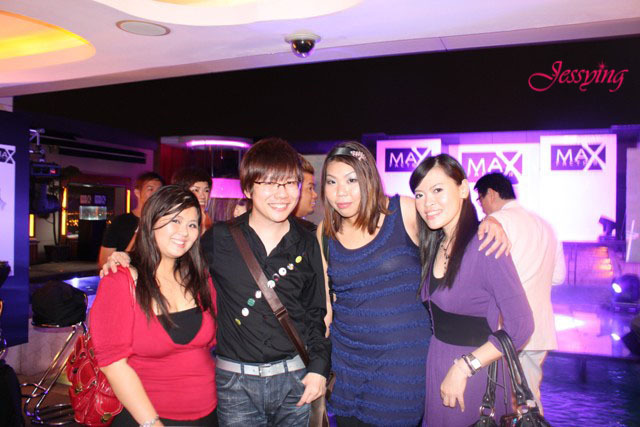 Finally Max Factors are in Malaysia ! And I invited another 2 girls (Sharon and Camie) to join me in this event to share the excitement! 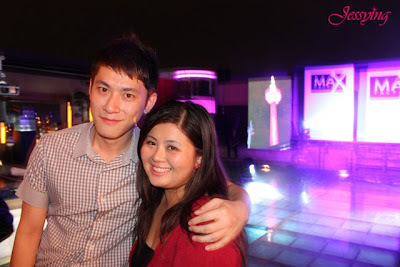 It was held in Luna Bar, Menara Pan Global at one fine evening. 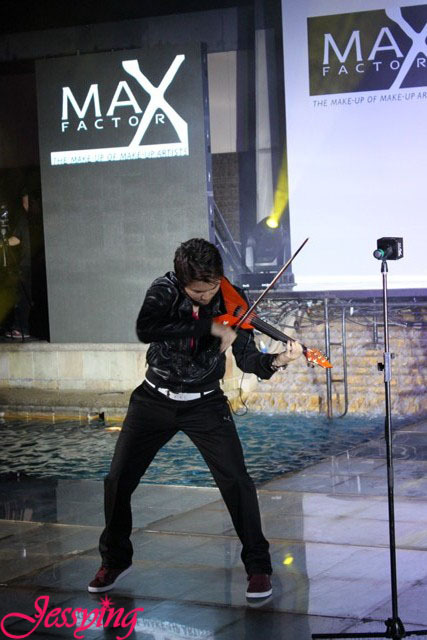 The setting of the event was beautiful and I particularly love the setting of the runaway stage. 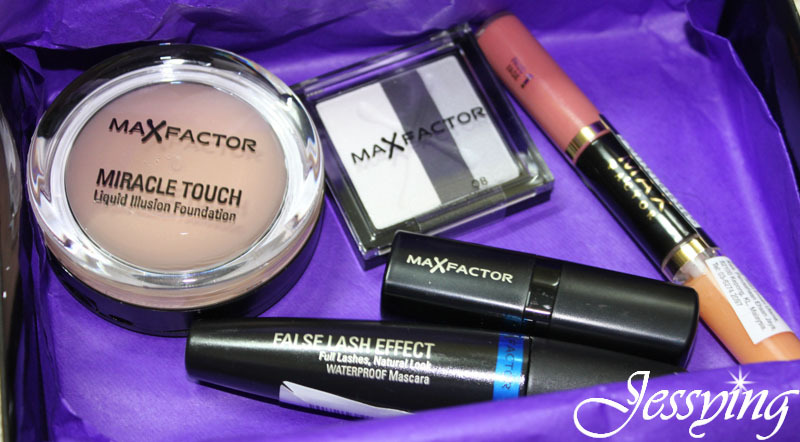 Do you know that Max Factor was founded in 1909 and it was named after the founder by late Maximilian Faktorowicz who designed the looks of the Hollywood stars of the day such as Joan Crawford , Bette Devis, Rita Hayworth and Katherine Hepburn. 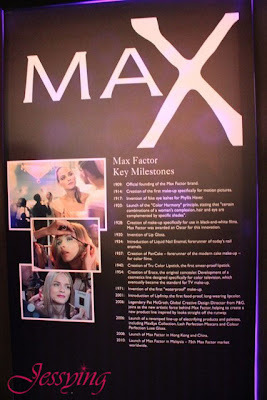 And today Malaysia was Max Factor 75th market worldwide. Even Singapore do not have Max Factor counters yet ! 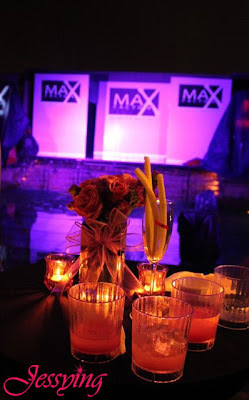 And yes we are so lucky because starting from today Max Factor, a brand of Procter & Gamble will be distributed by locally by StarAsia Malaysia !!! 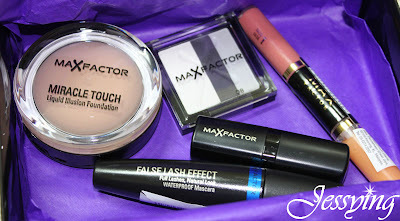 Max Factor's False Lash Effect Mascara is an astounding new mascara which need no further introduction as it ranked top selling in the global market. This is so far Max Factor's mascara biggest ever brush combined with iFX brush technology which was designed to dramatically thicken every lash right to the tip, even with smaller lashes, bottom lashes and those in the inner and outer corner of the eyes without clumping or globing ! Sounds impressive right!!! 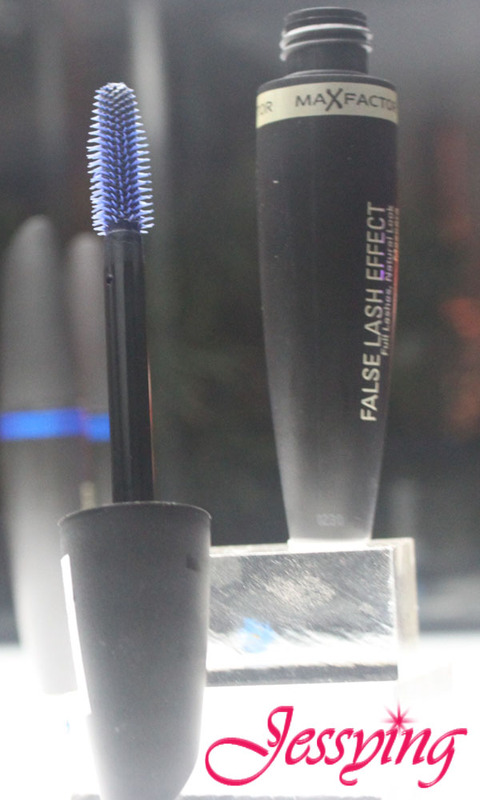 This is the mascara that will give you fake eyelashes effect ! 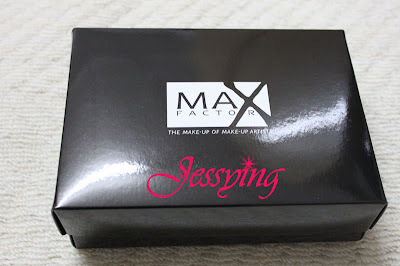 And guess what the mascara only RM66! Before the event started, Winnie Loo started by doing makeup demo using Max Factor products on one of the model. Camie also didn't miss the chance! As I came in full makeup, the only thing I could try is their Lipfinity . Wow I am impressed with this because this look almost similar with Shiseido MAQuillAGE Rouge Enamel Glamour which comes with a waterproof lipstick and moisturising gloss topcoat. I tried it and honestly the lipstick stain on my lips does not come out after hours of food, drink and wiping off with tissue! Another thing I try is Max Effect Dip in Eyeshadow. 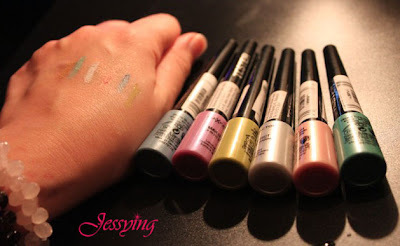 I tried it on my hands it is pigmented and intense. I am going to the counter to check this out one day! 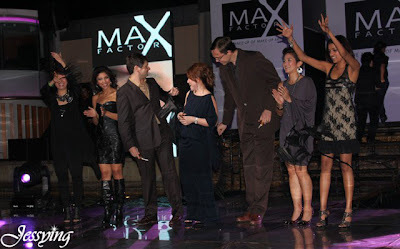 L-R: Winnie Loo, Mizz Nina, Fabio Stefani, Julia Wong, Noe Saglio, Melissa Indot, Jay Menon. Then came to a time where the VIPs are invited to cut ribbon to launch this event, however the ribbon was actually replaced by eyelashes instead and the VIPs tossed it away after cutting it,saying no to fake eyelashes! 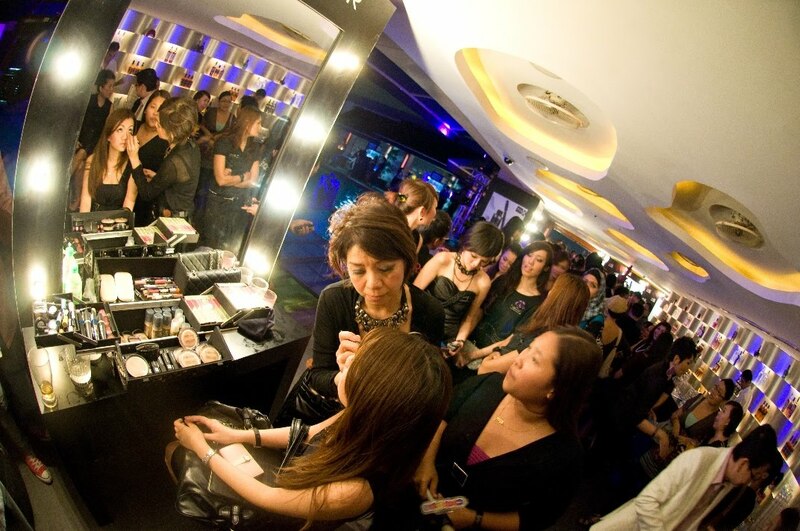 Drawing parallels between Malaysian icon and one of make-up's renowed brands, a projection of Max Factor was held in Menara KL as a canvas for 2 hours.!! Wow..nice right... Max Factors has invested so much in their launching! Here also Winnie Loo, the Chief Creative Director of AcutAbove was selected to be the make-up artist for Max Factor. She shared her make-up tips and did a live demo on guest model Nardine Ann the recent 2010 winner of Miss Universe Malaysia. 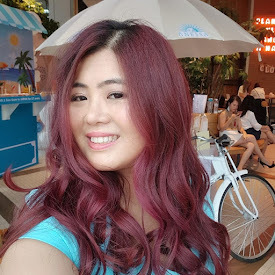 Winnie used the latest False Lash Effect Mascara to create a stunning and voluminous eyes for Nardine by giving her a truly impactful, spectacular and dazzling lashes. And yes Nardine was absolutely gorgeous that will make our head turn 360 degree !! Last but least , a picture of myself with False Lash Effect Mascara board! 2 vouchers to attend Max Factors Exclusive Mechanic at the stated location . 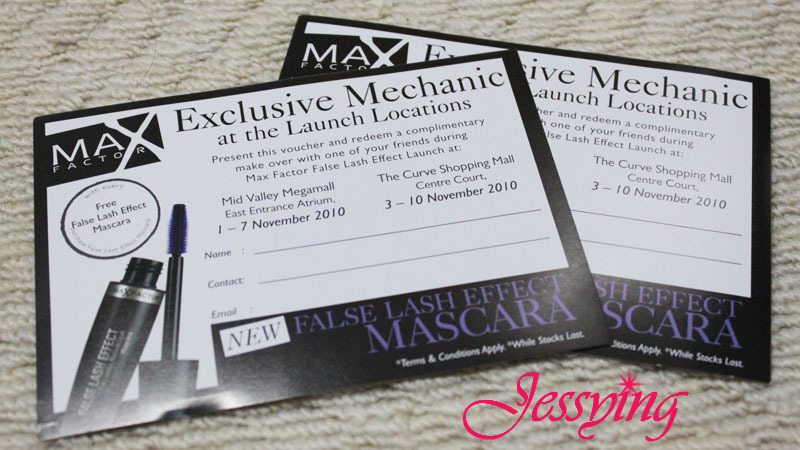 ALERT: BUY 1 FREE 1 FALSE LASH MASCARA EFFECT AT THIS 2 LOCATIONS ON THE STATED DATE! 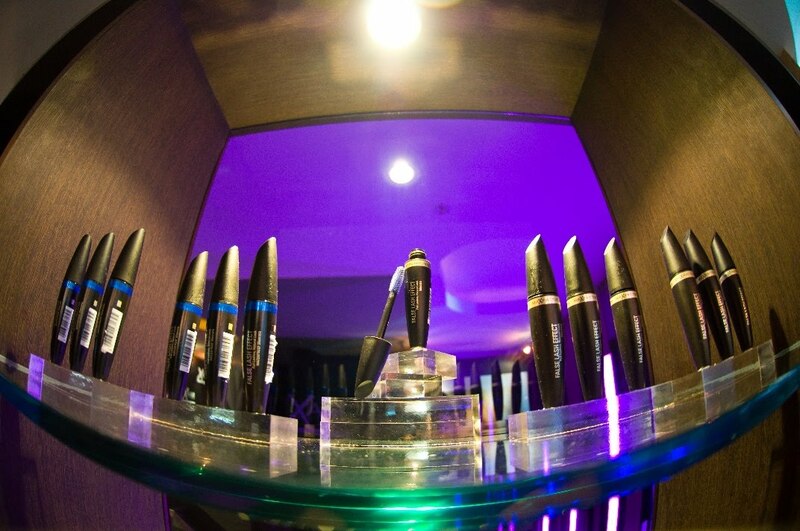 which means if you share with your friend, each of you get the mascara at RM33!!! T&C applies, while stock last! My goodies ! Yes its mine, everything in full size!!! I will have fun time playing with these babies! Now I can say bye-bye my fake eyelashes and say Hi to my new eyelashes ! And there will be more counters will be set up as time comes.